My computer profile: RAM 2GB and two HDD, One of HDD(hd1) will be use to installer and use windows. Another HDD(hd0) will be use to installer Grub4dos and boot file ISO.in hd0 ( installed grub4dos and it will be boot bios first) I created one partition contains menu.lst, grldr and another separate partition contains xp.iso + firadisk.ima. Highlights are the steps I have done any wrong step? Edited by trymse, 04 May 2013 - 02:18 AM. Where did that menu.lst originate from? I mean is it entirely your creation or you took it "as is" from some guide/tutorial or you took it from some guide/tutorial and modified it? Edited by trymse, 04 May 2013 - 02:36 PM. 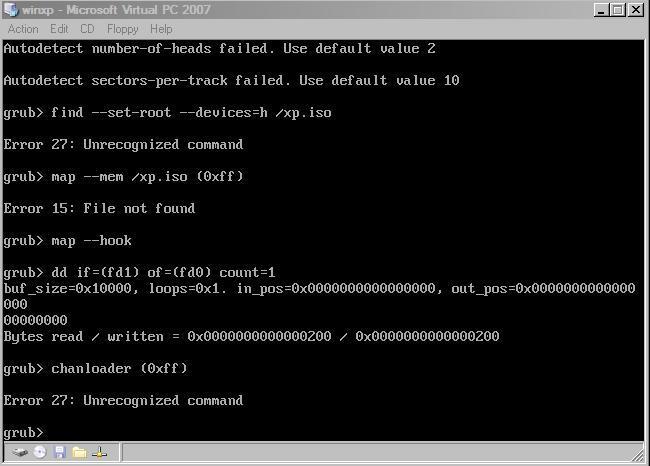 I presume that the error is caused by find --set-root before the hooking of the drives re-mapping, if the suggested modified code does not work, use command line, typing commands one by one, to understand which command creates the error. 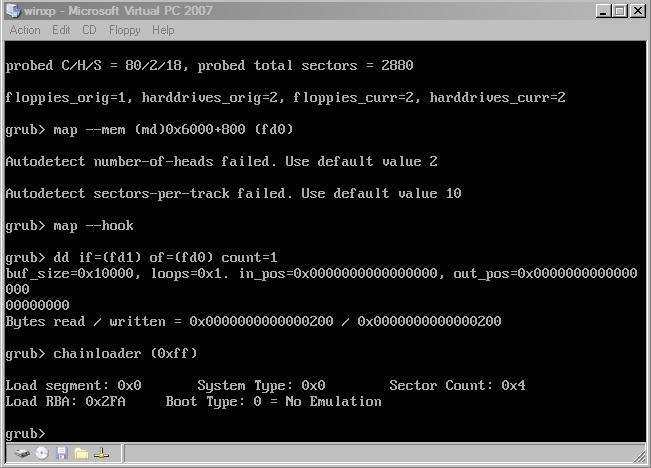 Mind you it could also be an issue with the simulated BIOS of Virtual PC. as the BOCHS BIOS included with it generally behaves as a "real" BIOS would do. It's a lot of time I don't use Virtual PC, but I remember issues with it's BIOS, as well there are more than a few issues with the Virtualbox one. I will use QEMU (+Qemu Manager) to try, Can not fit my firadisk.ima ?, I can download firadisk.ima where? Edited by trymse, 05 May 2013 - 10:03 AM. Why didn' tyou type all the commands? What do you mean "cannot fit"? You either have a floppy image containing firadisk (the firadisk.ima) or you have it not. In the setup you posted about using Virtual PC you have two hard disks (I presume two hard disk images). Map those same images in Qemu Manager. 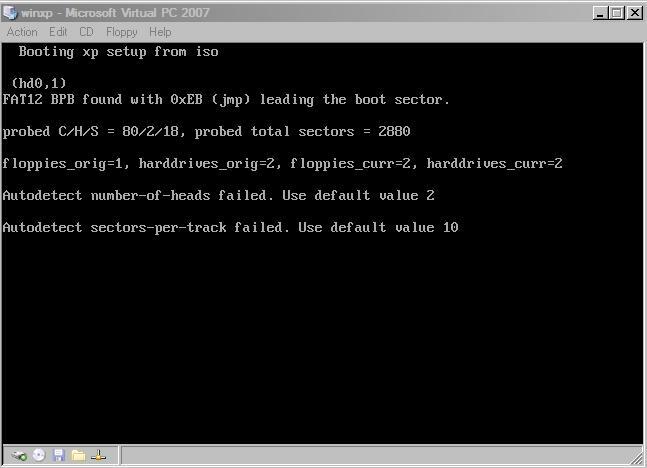 can HDD install easy2boot ? 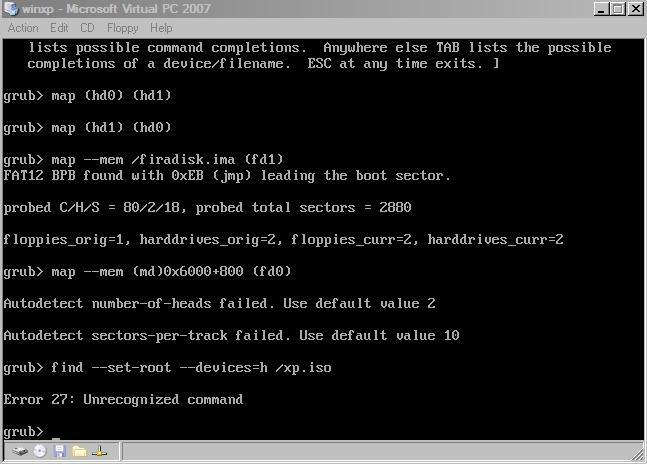 I just : install windows xp and boot hiren's boot(ISO - but still use all of its tools). thanks for the advice, I will learn about easy2boot and Try the above code. disagreement unpleasant language . The complete set of commands I suggested seems OK. Try re-doing those and add the final boot command. because most probably you are using an old version of grub4dos that does not include the "--devices=" parameter with find, follow cdob's advice and use a recent version. Be very careful when typing, the second error 27 you get with Steve6375's set of commands is because you typed chanloader instead of chainloader. 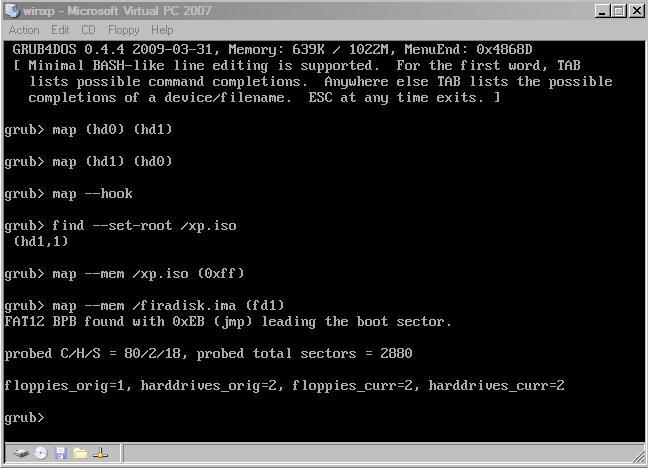 if i boot file Hiren's boot.iso with size: 683 MB (716,558,336 bytes),write something in menu.lst? Good , though noone but you will know WHICH EXACT "way" was succesful. I personally DO NOT support WAREZ and their usage, you may wait for Steve6375, who usually supports and promotes that particular release . Visit my site for Hirens menu.